It's a dangerous thing, letting a fourteen year old girl plan your first big mother-daughter vacation. The Intrepid Junior Blogger isn't just any kid though - this is the kid who created a PowerPoint presentation to convince me to send her to horse camp (and it worked as this summer was her second year at WildHorse Mountain Ranch and this time she spent two weeks there). I knew that whatever vacation she chose - as I left destinations and details to her, a true leap of faith - would be well researched. What she chose, though, was not exactly what I expected. I thought perhaps we would end up n Europe, back in England and Ireland perhaps or exploring France and Spain. When she said the words: "Caribbean cruise" I was surprised as it had never even occurred to me that this was a place she wanted to go. When she followed it with: "on the largest cruise ship in the world" I knew it was the engineering side of her brain at work and her fascination with big machines. 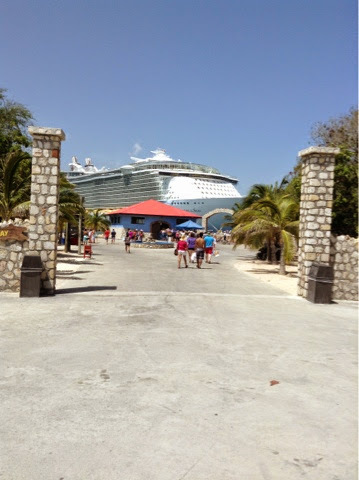 She explained that in Grade 7 science class at Ecole McTavish they had watched a video on the making of Royal Caribbean's Oasis class cruise ships, which is how we find ourselves on Allure of the Seas (if you are reading this, Mr. Shack, I'm looking at you!). The Allure of the Seas is a behemoth. I don't use that word lightly (it's not a word anyone should use lightly or often, really). This ship is monstrous in dimension, a spectacle hard to reconcile when you see it in harbour for the first time and realize it towers over the buildings around it. It holds a town's worth of travellers, 6,000 or so, plus crew, making it into a living and vibrant town at sea. It has several different "neighbourhoods", each more mind-boggling than the last (a zip line? Yes! A carousel? Yes! A shopping district? Yes! Nightclubs? Yes! The first Starbucks at sea? Thank god, yes!). It combines the old-world charm of sailing the oceans with every modern convenience and option, and as the IJB planned our seven-day Caribbean cruise even I became excited - with one exception. All the stories I heard and read indicated how expensive Internet service is on cruises. The amounts I heard were astronomical, and frightening enough that I advised the IJB that we would disconnect for the entire week, leaving behind our social media networks for our holiday. While we both accepted it I think we were equally uneasy about it, but then too I had read so much about the value and importance of "disconnecting". When we left Fort Lauderdale we said our farewells on Facebook and email and Kik and Twitter. We boarded the cruise and settled in to wait for our departure. While we sat waiting, shipboard Starbucks in hand, I quietly logged onto the ship's Wifi to see what exactly the service cost. What I found was that it cost much less than I had feared. For about $35 a day the IJB and I could have unlimited Internet access. I faced a dilemma. Tell the IJB and discuss the option, allow her to learn it herself (as she undoubtedly would) or simply refuse to connect? One of the things I have learned over the past few years is that there is no singular "right" way to do things. What works for others may not work for me. What others need or want may not be what I need or want. And so, in the middle of the Royal Promenade, the IJB and I discussed the decision we faced - and then we reconnected. You see for her and I social media is something we enjoy. We interact with our peers and friends online, we share our thoughts and stories and we find entertainment and value in our time online - and there is nothing wrong with that, either. It's just who we are. We are spending much more time together on this cruise, talking and laughing far more than usual. Our connective devices are put away at mealtimes and when we are enjoying the many sights and sounds of the sea, but for those long moments when the ship is sailing, the dark night surrounds us and we are tucked into our stateroom, we are connected once more with the world onshore. I would never judge those who choose to disconnect, as perhaps they need or want to do so. Not everyone needs - or wants - to disconnect though, even when on vacation. For some of us we don't take a vacation from our social media. We take our social media on vacation, finding it can actually enhance the time we spend away by sharing it not only with each other but with our social media networks. There is no "right" way to be connected - just the way you want to be. For this vacation the IJB and I chose to connect with a cruise ship, 6,000 new friends, some new destinations and all our friends onshore, too - and it's turning into the perfect vacation, all thanks to the IJB.